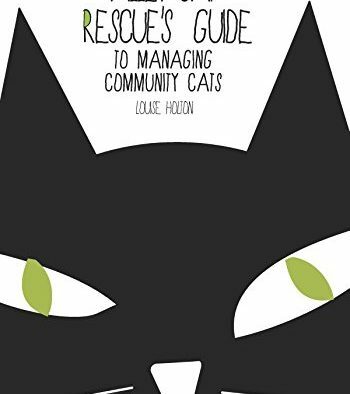 I can’t tell you how excited I was to receive Louise Holton’s new book, “Alley Cat Rescue’s Guide to Managing Feral Cats”. This book is the definitive guide for anyone who works with feral cats in the TNR (Trap, Neuter, Return) in any capacity. Whether you’re someone who wants to help the cats in your neighborhood, a long-time TNR activist, or a veterinarian exploring ways to get involved. In her book, Holton details every aspect of how to TNR a colony of feral cats. Thankfully, the nation is finally acknowledging the many advantages of TNR. It’s every cat person’s hope that the antiquated, barbaric, and highly ineffective traditions of the “catch and kill” method will be left in the dust – this book makes it possible by showing how TNR programs have changed the way we look at feral cat colony management. Holton takes the reader through an in-depth and fascinating look at our history – from the evolution of “Felis Catus” to the adoption of a no-kill approach to animal rescue. It offers comprehensive advice for dealing with neighbors who are opposed to the practice of TNR and provides plenty of practical, easy to implement, solutions for those who are simply opposed to feral cats ranging through their backyard. The entire TNR process is discussed in great detail, so that anyone interested in getting involved can easily pick up the basics and implementation of the program in their own neighborhood. Best of all, it provides plenty of scientific evidence on why TNR is the best approach to colony management. If you’ve ever engaged in a discussion with someone opposed to the practice, refer to this book – you will never be left wordless again. I particularly liked the chapter on safe relocation of feral cats. While this is not a recommended practice, it’s often the only way to safely help a colony. This offers lots of practical experience and detailed plans on how to move a colony safely. There is an entire chapter devoted to the health and safety of a colony. Caretakers have vast responsibilities, and ensuring the colony remains healthy is just one of those. This book offers some fantastic advice on the care of these wild animals. Publisher: Alley Cat Rescue, Inc. If you’re a veterinarian, Holton has not forgotten you. Of course you understand how challenging caring for any cat, let alone a feral cat, can be. This book has an entire section devoted to the veterinary professional on health guidelines, treatment and care, and how to do it all safely and inexpensively. It discusses a variety of sterilization methods (including left-flank and chemical sterilization). This is a must-have book for any medical practitioner devoted to saving lives and improving the plight of animals. Also included is a glossary of terms, a huge section on debunking the myths from the bird activists (as well as a look at their faulty science has been more promotional than scientific) and plenty of other facts that you will need as a caretaker or supporter of TNR. Have you encountered a person who doesn’t believe that TNR is the best way to manage a colony to reduce cat overpopulation? In this book, Holton provides a plethora of scientific studies, dozens of case studies, and an effective counter to every argument against the practice. You’ll never lose a debate with this guide at your side. PetsWeekly, 2018 ©All rights reserved.